Segnaliamo l’uscita nelle librerie del libro di memorie di Buthayna Shaaban, consigliere per l’informazione della presidenza siriana, e per anni interprete inglese/arabo del defunto raìs siriano Hafez al Asad, padre dell’attuale presidente Bashar al Assad. 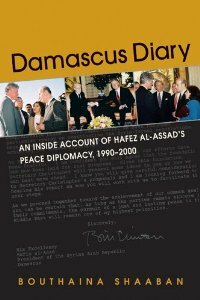 Damascus Diary offre uno sguardo dall’interno sui colloqui di pace svoltisi negli anni ’90 tra siriani e israeliani con la mediazione degli Stati Uniti. Di seguito la scheda presente sul sito dell’editore Lynne Rienner. Bouthaina Shaaban worked closely with Syria s President Hafez al-Assad from 1990 until the time of his death, serving as both official interpreter and adviser. Her new book, part memoir and part historical account, takes the reader behind the closed doors of the Syrian Presidential Palace to provide uniquely Syrian perceptions of the failed Arab-Israel peace talks. Sharing firsthand stories of relationships (her own and Assad s) with members of the Bush and Clinton administrations, and drawing on previously unavailable minutes and other documents from the Syrian presidential archives, Shabaan takes us from the early Syrian-US engagement in 1990 1991 to the three Assad-Clinton summits in 1994 2000. In the process, she includes intriguing revelations about the Rabin Deposit, the April Understanding on Lebanon, and the 1998 Track II effort with Israeli prime minister Benjamin Netanyahu. Shaaban offers the first account of these negotiations to come from a Syrian insider–an essential contribution to our understanding of the enduring conflict in the Middle East.